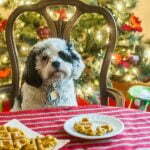 These Christmas pumpkin dog waffles are a healthy and easy way to treat your pet this holiday. Made with only 5 ingredients and you can feel good about giving your pup their own special breakfast. In a food processor add the oatmeal and grind to a powder. In a large bowl, mix all the ingredients until well combined. Use this batter to make waffles according to your waffle maker's instruction. Mine does not require creasing before hand but your might. Store in the refrigerator. Should keep for about a week.